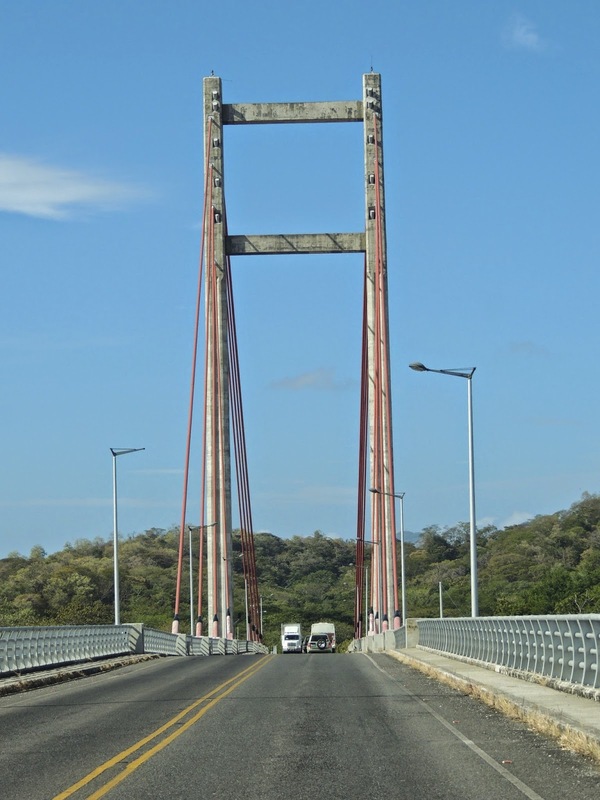 This is the "Friendship with Taiwan Bridge" that carries traffic over the large mouth of the Tempisque River at the north end of the Gulf of Nicoya. Before he bridge was built traffic to reach the Nicoya Peninsula had o go across a ferry, which of course took a lot more time. This route is used by people coming from San Jose and central Costa Rica to the northwest provide of Guanacaste, where Tamarindo is located. The bridge yes its name from the fact that the Taiwanese built the bridge. It was a very nice thing for the Taiwanese to do, as it has made a long-lasting improvement to the transportation and infrastructure of the country and has achieved a substantial convenience for a lot of people.. I am sure tha the Taiwanese are disappointed that Costa Rica has subsequently used mainland Chinese resources for substantial construction projects. The Chinese built Cosa Rica's new national stadium, used for soccer/football matches and major concerts and other events. There is talk of using financing and construction resources from mainland China to upgrade the highway from San Jose to the Caribbean coast. It was a little hard to feet photos of the leaf cutter ants up close as they were crawling in and out of their den, as I showed yesterday. So I picked up a stick that had several ants on it and held it up in front of my camera lens. In this photo there are several ants on the top of the twig, and an ant upside down carrying a left many times larger than the ant's body. It is a sign of the resilience of nature that there could be an underground world right on the grounds of a large, sophisticated high-tech factory such as Costa Rica's Intel plant. Yesterday's photo showed a photo of a hole in the trough in the grass. This is a closer view of the hole. It reveals that the hole was not made by a rodent, but by leaf cutter ants. They were carrying a steady stream of leaves down the whole. As I have mentioned before, leaf cutter ants choose only certain types of leaves, not to eat them, but to feed the leaves to a fungus underground so that the ants can eat the fungus. There was not a lot of light at the entrance to the hole, as it was very late in the afternoon. This photo is therefore not the best, but I decided to take matters into my own hands, as I will show you tomorrow. While taking photos of the Intel plant, I noticed a trough in the grass lawn surrounding the factory. In fact, there was a network of these troughs snaking through the grass. What could they be? Well, this is Costa Rica. I will show more in the next few days. Today is Sunday, so we have new photos posted on our Viva la Voyage travel photo site. This week we are showing photos of the architecture of Portugal. Here is another photo of the Intel plant. In 1999, Intel accounted for 30% of Costa Rica's exports. By last year, the diversification of Costa Rica's economy resulted in Intel's share of exports dropping to 13.7% last year. The loss of such a large percentage of the country's exports with Intel's announcement that it is transferring manufacturing from Costa Rica to Asia is significant. The diversification of Costa Rica's economy is reflected in more than $8 billion of direct foreign investment and 30,000 new jobs created during 2010-1013, particularly in medical equipment manufacturing. I promised a few days ago that there would be a Costa Rican flair to this factory, but these little queen palms planted outside are not it. Shortly after taking this photo, I looked down at the grass and saw a curious mystery, which I quickly solved and will share in the coming days. This week we have photos from our recent cruise in Mexico's Sea of Cortez posted on our Viva la Voyage travel photo site. The large factory I showed yesterday is an Intel factory. Computer chips are Costa Rica's leading export. That's right. The original "banana republic" produces more export revenue from computer chips than it does from bananas, or coffee, and Costa Rica is well known for its coffee. Quite sadly for Costa Rica, Intel has announced earlier this month that it will close its manufacturing in Costa Rica and transfer those jobs to Asia. That will be a loss of 1,500 manufacturing jobs. Intel will keep 1,200 jobs in its engineering and design facility and will add 200 more. This loss of high tech manufacturing jobs is a source of great concern in Costa Rica, of course, as I will explain further tomrrow. Ecotourism is Costa Rica's number one industry. But today's photo is not a tourist sight. This is a photo of a factory that is extremely important to Costa Rica. I will show and explain more in the next few days. I will also show a few photos of a uniquely Costa Rican twist to the lawn outside this factory in a suburb of San Jose. We have photos from a cruise up the east coast of Baja California in Mexico's Sea of Cortez posted this week on our Viva la Voyage travel photo site. Afer showing so many ancient artistic creations lately, I thought I should show a more contemporary artistic expression. 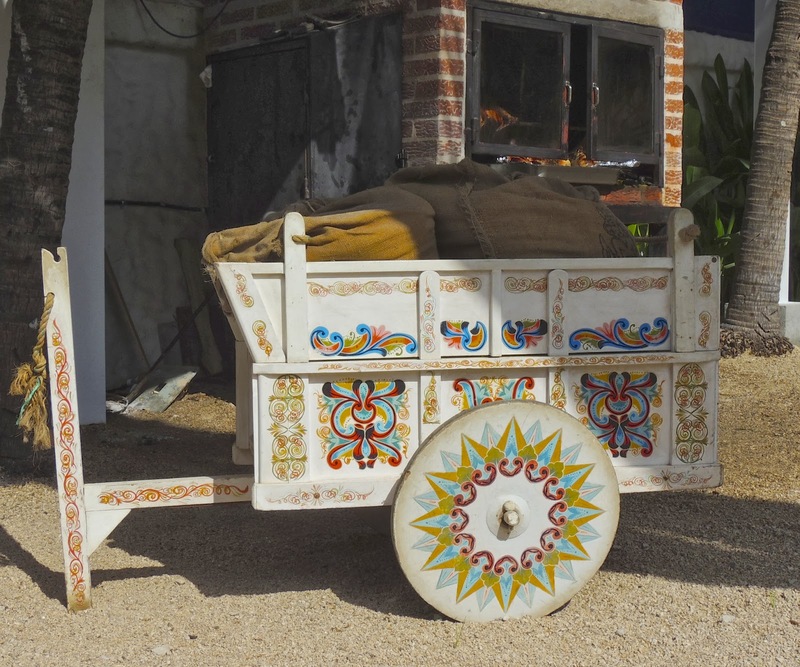 This is an example of Costa Rica highly decorated ox carts, although this one is unusual because its base coat is white rather than red. This is not a working ox cart. It is a display on the grounds of the Tamarindo Diria Resort, where we have one of our two condos. 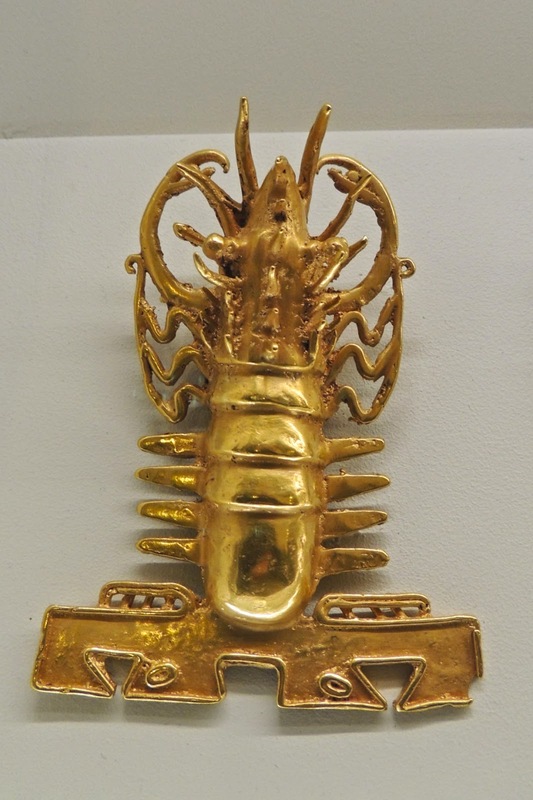 This is a closer view of one of the gold lobsters in the Pre-Columiban Gold Museum in San Jose. This looks rather realistic, although the artist took some license, if we want to get nit picky in comparison to anatomical details. The front claws look small and the tail is large, but the skill and artistry is impressive, particularly for being more than 600 years old. Rather than focusing on the details, I think the larger question is why did the artist decide to make a lobster. There are lots of more attractive animals to choose for a subject. Maybe he enjoyed the taste of lobster. Here are some more of the stone jaguar metates in the Pre-Columbian Gold Museum in San Jose. These metates were not used for grinding corn, as they do not show signs of being used. Instead, they were funerary offerings buried with nobility between 500 B.C. and 500 A.D. 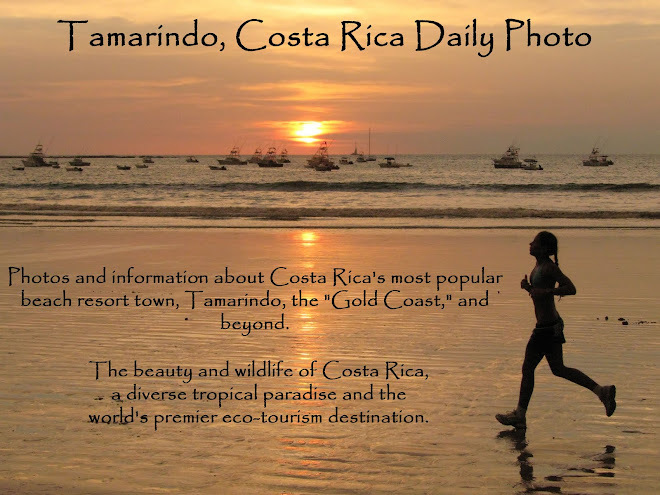 They come from northwest Costa Rica, which is the province where Tamarindo is located. The skillfulness of the artisans who carved these is indeed impressive. 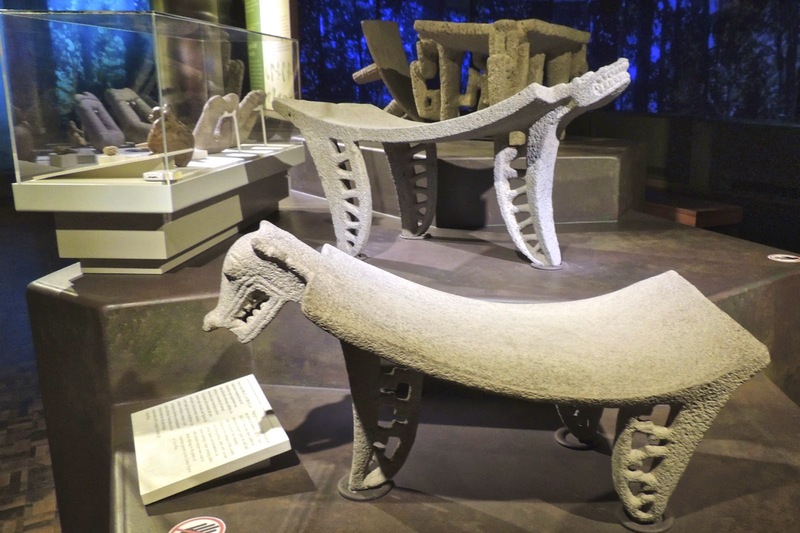 It is also interesting how ancient cultures incorporate animal designs into the most precious of objects, as metates buried with nobility must have been. "Little frog, what big eyes you have." 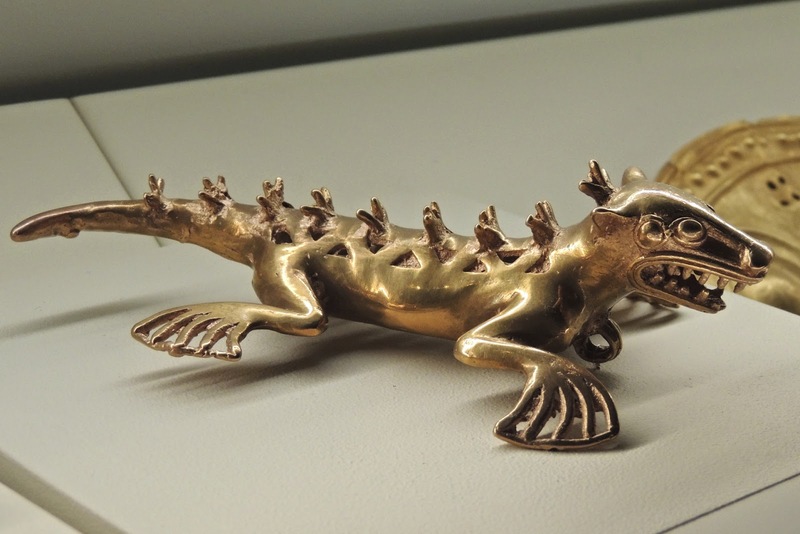 I have been showing a series of photos of objects in the Pre-Columbian Gold Museum in San Jose recently, including a gold frog. I therefore decided that today I would post a photo of one of the types of frogs that perhaps might have been the inspiration for Native americans centuries ago to create gold objects such s the gold from that I showed about a week ago. Today is Sunday, so we have new photos posted on our Viva la Voyage travel photo site. This week we are showing photos from a cruise that we took a couple of months ago in the Sea of Cortez, up the east coast of Baja California, in Mexico. 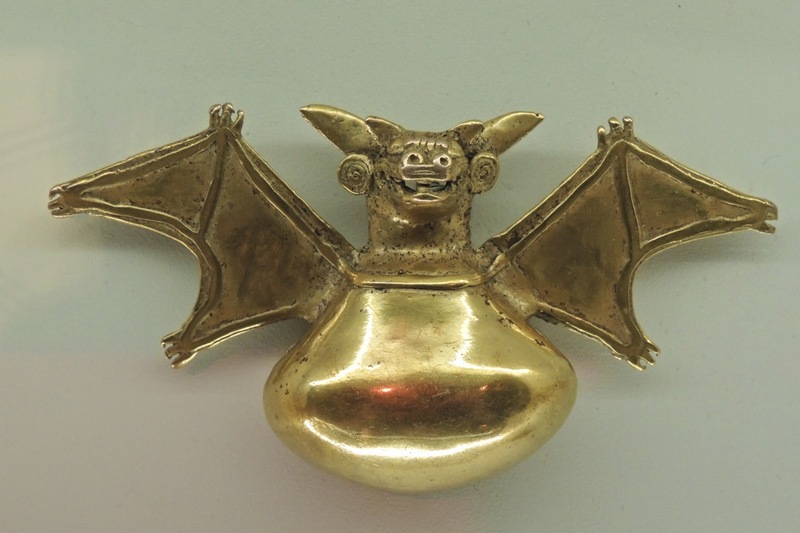 After showing a pre-Columbian gold frog, lizard, bat, and lobsters, it should not be a surprise that the indigenous culture produced gold monkeys as well. I assume that the monkeys interacted with the Native Americans even more than they do with modern people, as the pre-Columbian cultures certainly lived in closer proximity to wildlife than modern people. 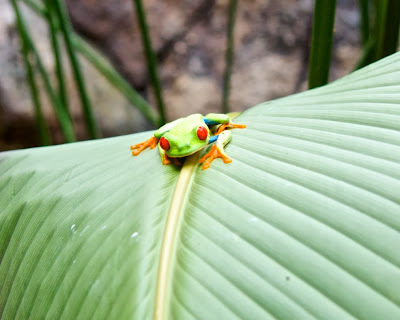 This week we have photos from the Galapagos posted on our Viva la Voyage travel photo site. Butterflies are abundant in Costa Rica, many of them large and colorful. 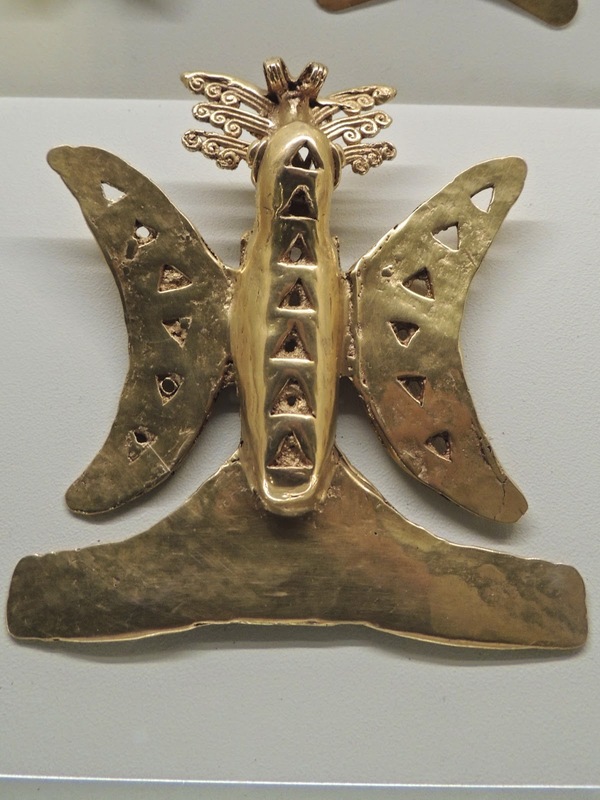 The indigenous cultures centuries ago evidently admired the butterflies as well, as reflected by this specimens in the Pre-Columbian Gold Museum in San Jose. 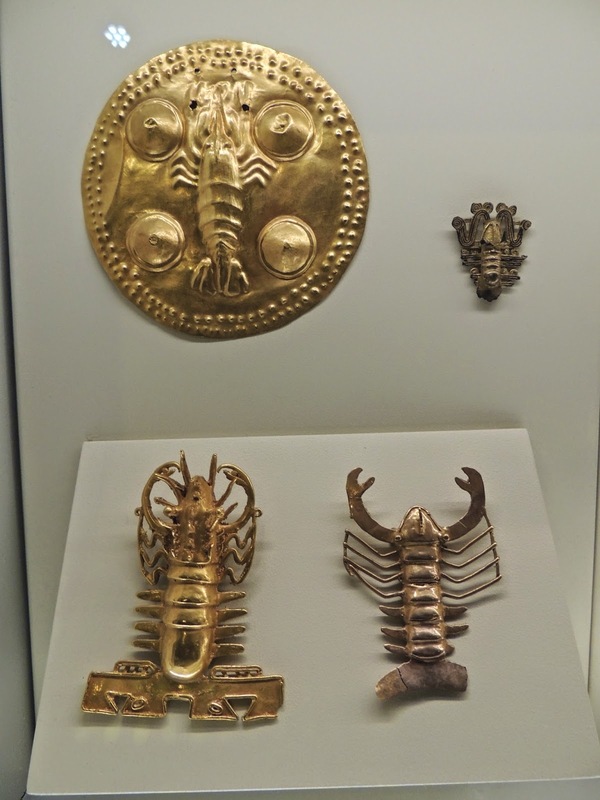 These gold objects in the Pre-Columbian Gold Museum all have a lobster motif. This is consistent with the location of the culture on the Nicoya Peninsula of northwest Costa Rica. We continue to have lobster in the area today. In fact, the beach where one of our two condos is located is Playa Langosta, which translates as Lobster Beach. We occasionally see local fisherman with a few lobsters, and some of the local restaurants have local lobsters on the menu. It appears that the native Americans enjoyed lobsters 1,000 years ago as much as we do today. 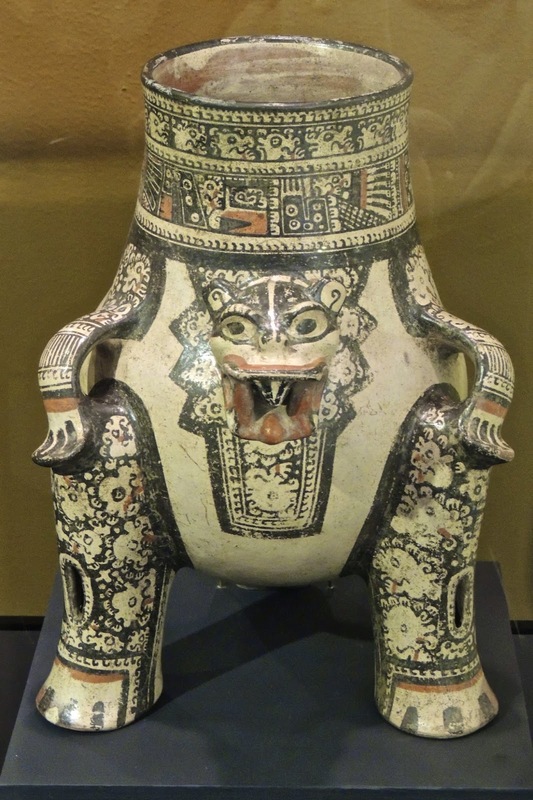 This is another of the pre-Columbian ceramics in the Pre-Columbian Gold Museum. This is a tripod vase with a jaguar motif. The creativity and skill of the indigenous culture is indeed impressive. Most of the ceramics on display in the museum came from the Nicoya peninsula in northwest Costa Rica, where Tamarindo is located. I don't know what thought process or dialogue went into the selection process for animal subjects of pre-Columbian gold objects. I would not think that bats would be high on the list, but this bat looks rather friendly. In fact, his face looks almost cartoonish. 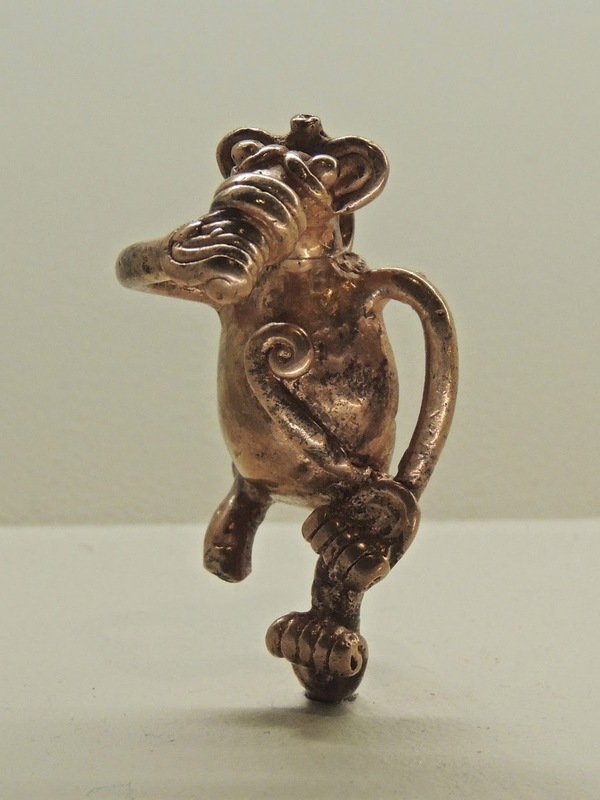 A few days ago I showed a gold frog from the Pre-Columbian Gold Museum. This is a gold lizard, or perhaps it is an iguana. I guess it should not be a surprise that they would make gold jewelry in the shape of the animals around them. Can you guess what other animals they might have used as subjects for their art? I will show some additional examples in the days ahead. Costa Rica is known for its eco-tourism and not for its pre-Columbian culture, but this vase is an example of a pre-Columbian culture that has survived. 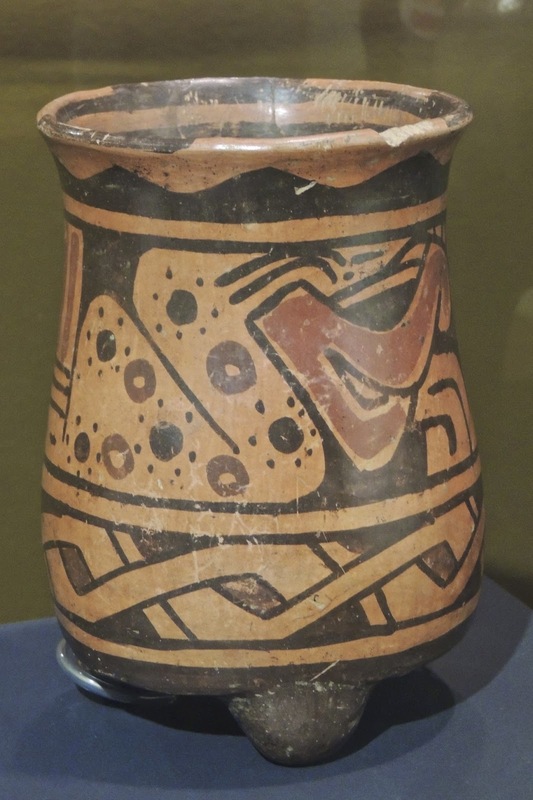 This vase in the Pre-Columbian Gold Museum in San Jose is similar in design and coloration to the Chorotega pottery that is made today in Guatil and nearby communities not far from Tamarindo. I have shown modern examples of chorotega pottery in earlier posts, which can be seen by using this link. There is even a store in Tamarindo that teaches visitors how to make their own chorotega pottery as souvenirs to take home. Today is Sunday, so we have new photos posted on our Viva la Voyage travel photo site. This week we are showing some additional photos form our recent trip to the Galapagos Islands. 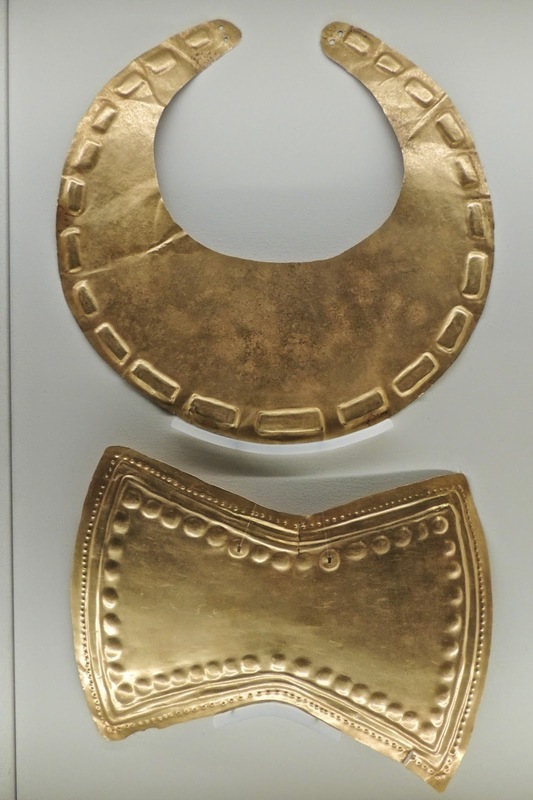 This exhibit in the Pre-Columbian Gold Museum showed how and where some of the items of gold jewelry were worn, such as the necklace that I showed yesterday. For people who must have been challenged just to meet the basic necessities of life, they evidently prized jewelry and adornment. This week we have photos of the Trinity College Library in Dublin, Ireland posted on our Viva la Voyage travel photo site. This is a gold necklace in the San Jose Pre-Columbian Gold Museum. The second object must also have been something that the native Americans wore, but I am not sure exactly what it is. 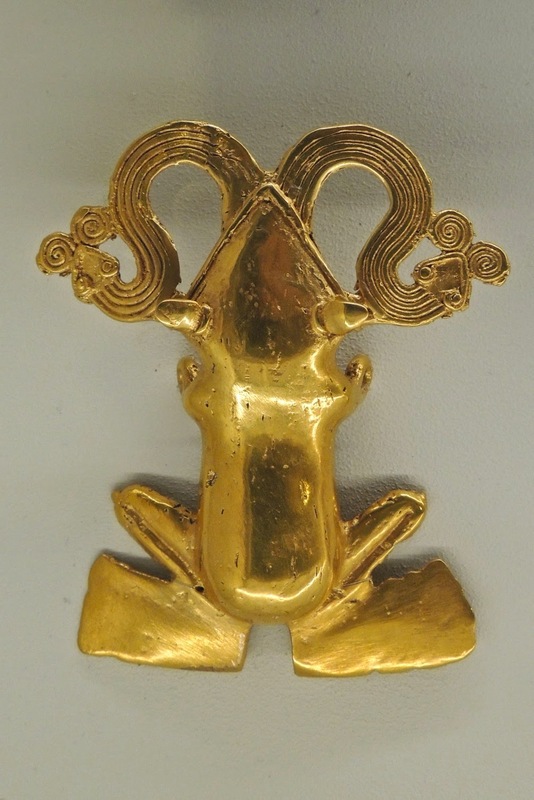 This is a gold frog in the Pre-Columbian Gold Museum. One of the things that amazed me about the museum's collection, in addition to the skill and artistry of those who created the items, was how the artists were inspired by the animals of Costa Rica. People come to Costa Rica today because of the popularity of ecotourism and the wildlife and natural beauty of Costa Rica. The pre-Columbian cultures also admired the wildlife. 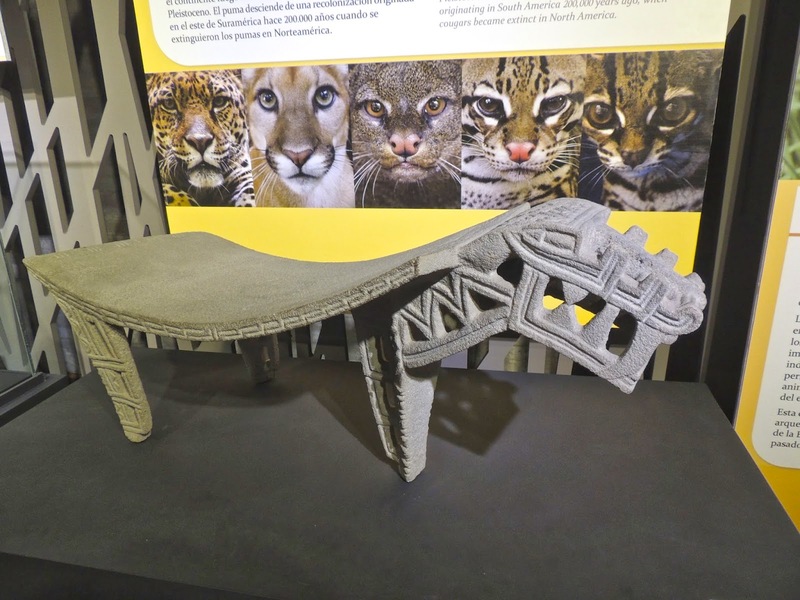 I have seen several Costa Rican jaguar metates before in museums in the USA, so I was very interested to see this one in the Gold Museum in San Jose. 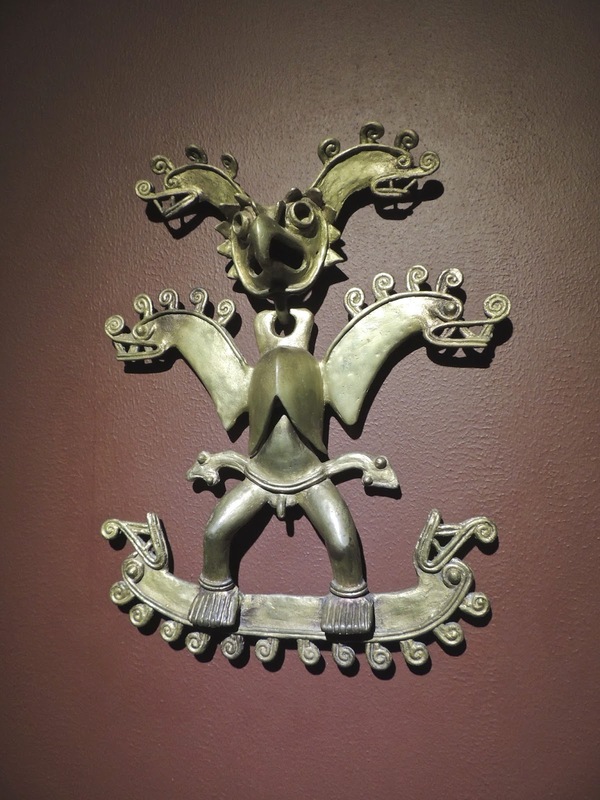 These are from the time period of 1,000 A.D. - 1350 A.D.
Just inside the door to the Pre-Columbian Gold Museum was this spectacular part human-part animal figure. 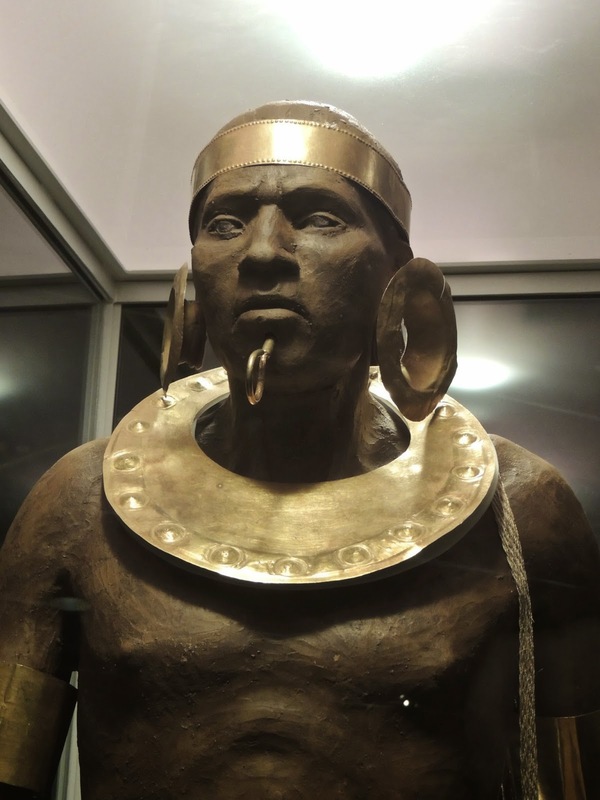 One curious aspect of the very impressive and extensive collection of pre-Columbian gold is the source of the gold. Costa Rica did not have gold mining. Columbus named Costa Rica the "rich coast" because the Native Americans who greeted him there appeared rich because of their gold. But the gold came from elsewhere. After the Spanish realized that Costa Rica did not have gold or silver, they largely ignored it, but they did send indigenous Costa Ricans to Peru to work as slaves in the silver mines. Costa Rica is the only country in Latin America without a liberator. It never had a struggle for liberation. When Spain granted independence to Nicaragua, it abandoned its sovereignty over Costa Rica as well. Inside the large underground art museum was a vault-like door that is the entrance to the Pre-Columbian Gold Museum. It is a museum within a museum. 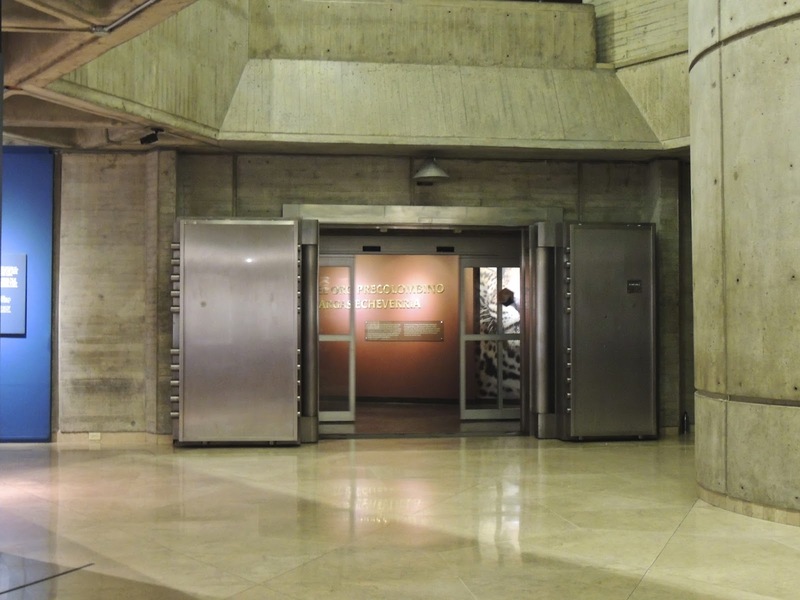 Maybe the underground location of the museum, besides creating space for a plaza above ground, was also considered a good design for security reasons. Art thieves can't break in or out of windows if there are no windows. I will show photos of the collection beginning tomorrow. 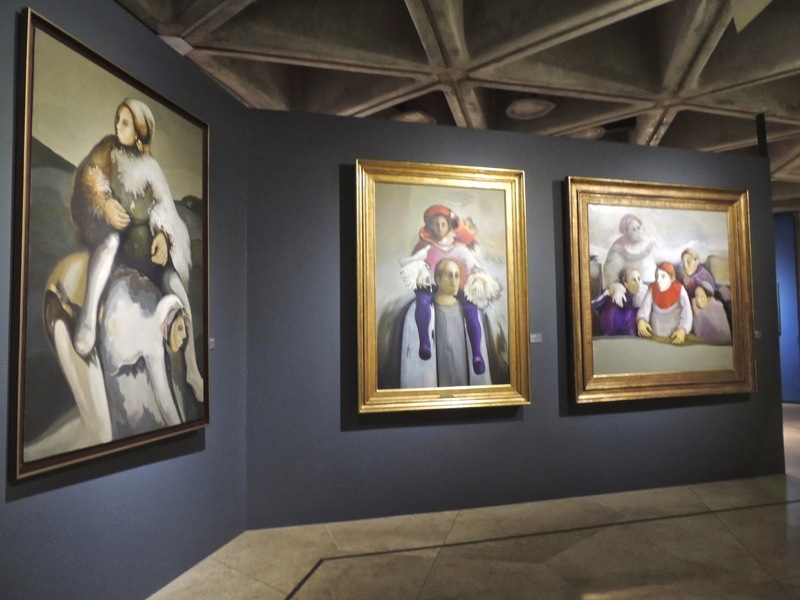 When we visited the museum, they had an exhibition featuring the art of Lola Fernandez. She was born in Cartagena, Columbia, in 1926, but her family moved to Costa Rica within her first few years. The big, bold figures in the paintings in this photo are typical of her style. She was featured in exhibitions in Costa Rica as well as elsewhere in Latin America, the U.S., Europe and Japan in the 1980's and 1990's. She continued painting into the 21st Century. Costa Rica's High Ranking on international Social Progress Index. The Tico Times newspaper has an article about Costa Rica ranking number 1 in Latin America and 25 of 132 countries ranked on a Social Progress Index that measures fulfillment of basic human needs, such as medical care, education, nutrition, clean water, personal safety, human rights, tolerance, etc. Its ranking was comparable to Italy and Spain, even though those countries had higher economic output per person. The USA ranked number 16. New Zealand was first. Costa Rica's ranking was due in part to especially high rankings in nutrition, water, sanitation and opportunity. Today is Sunday, so we have new photos posted on our Viva la Voyage travel photo site. This week we are showing photos of the Trinity College Library in Dublin, Ireland. An underground museum does not have architecture that is visible from the outside, but it does have interior architecture. 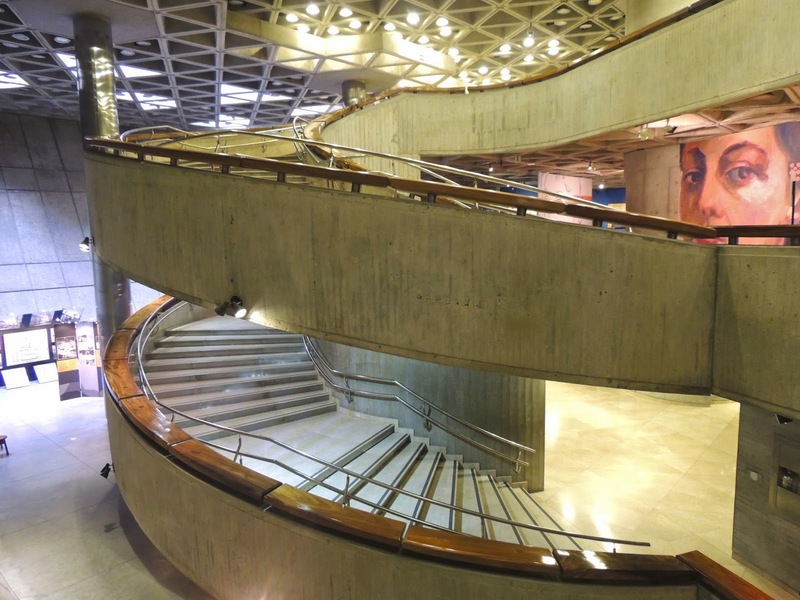 The central staircase in San Jose's underground museum complex has a broad spiral staircase. Perhaps the architect was inspired by /frank Lloyd Wright's design of the Guggenheim Museum in New York. I will show some photos of parts of the collection in the days ahead. This week we are showing photos of the Sydney Opera House on our Viva la Voyage travel photo site. 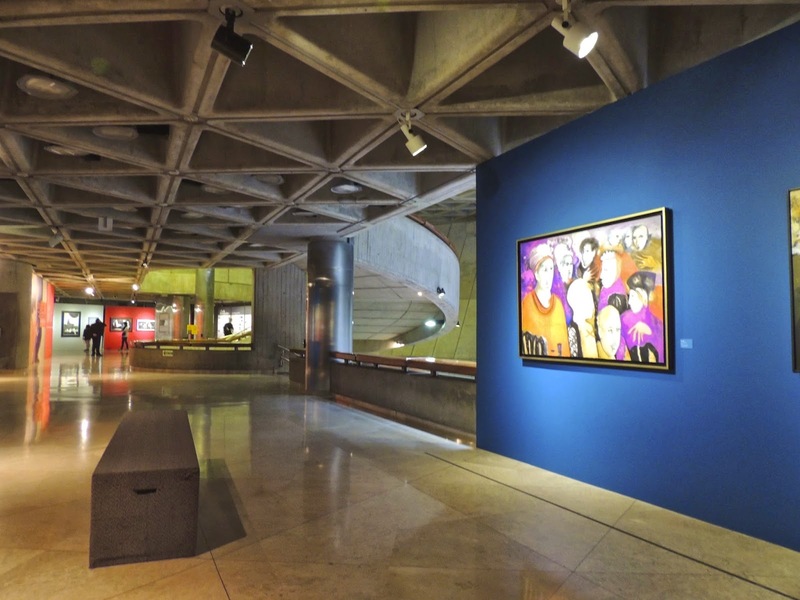 I wasn't sure how I would feel about an art museum entirely underground, but the Costa Rican art museum was spacious enough that it did not feel claustrophobic. I suppose the underground museum has the benefit that there would not be sunlight that could fade the art work. 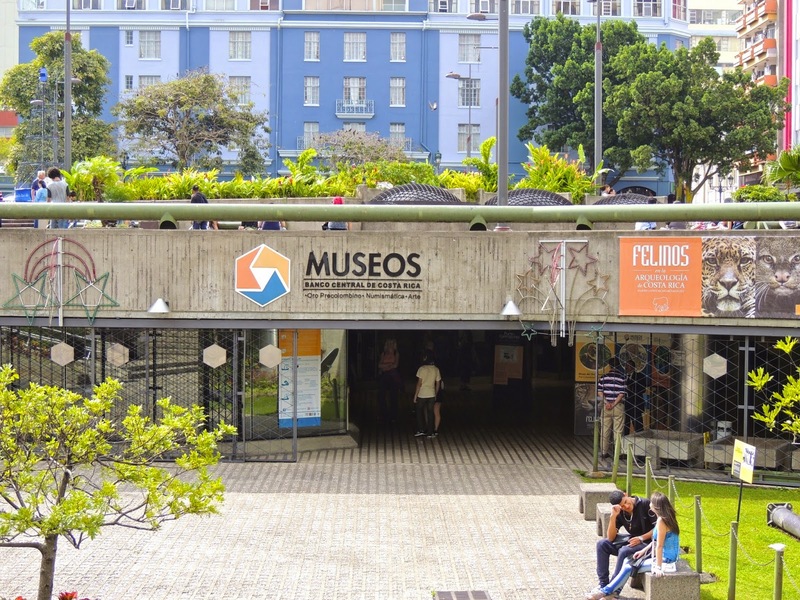 Under the plaza next to the National Theater are three museums. This is the entrance, but the museums are entirely underground. Gold Museum and the Art Museum, and I will show some photos from them during the coming weeks. 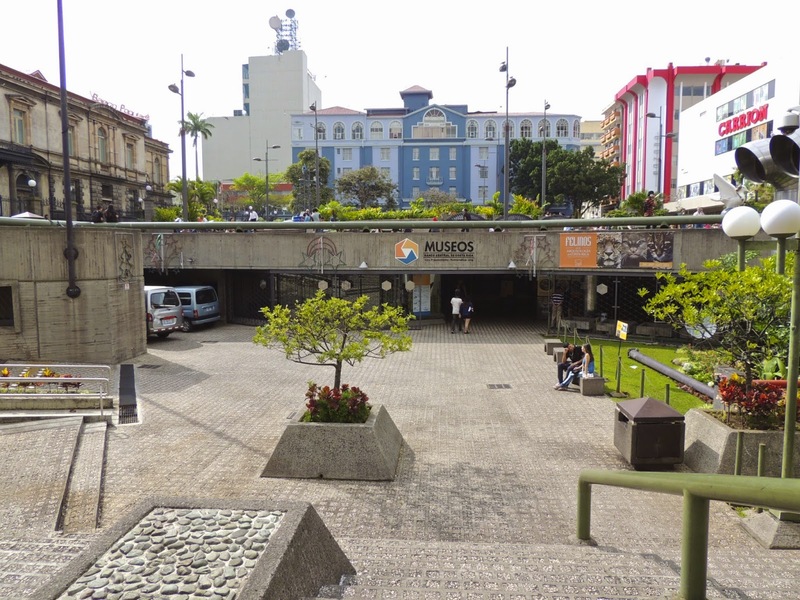 What is under the plaza next to the National Theater? This is a view of the plaza next to the National Theater, which is on the left of this photo. In the coming days I will show what is under the plaza. This is the entrance. I have seen photos reflecting that they sometimes use the sunken part of the plaza shown here as an area for outdoor concerts. Michael Landon's Former Costa Rican House -- Theme Day for "Triangles"
The worldwide Daily Photo theme for April 1 is "triangles." 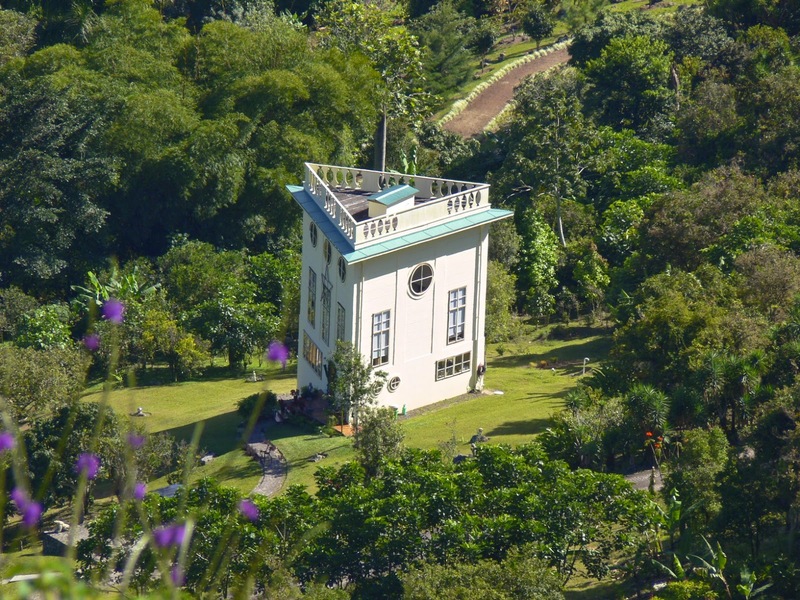 When I learned of the theme, I immediately thought of this triangular house in a valley near San Jose. This house used to belong to the late Michael Landon, the TV star of Bonanza and Little House on the prairie. I am sure Michael Landon enjoyed his time in the quiet, relaxing atmosphere of his Costa Rican retreat, with pleasant temperatures year round and a lush, green landscape. To see how other City Daily Photo blogers have interpreted the theme of "triangles," click on this link.